A movie starlet with a gangster boyfriend and a pair of siblings with a shared secret lure Marlowe into the less than glamorous and more than a little dangerous world of Hollywood fame. Chandler can spin you an impressive tale and he does it in a style which would make any writer drool – easy to read, atmospheric, funny and somehow real. 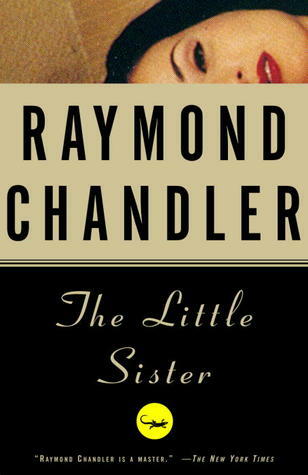 Still only after rereading this one I noticed that detective Philip Marlowe is, in fact, a Mary Sue. Or rather Gary Stu. A man without a background or family, a man without friends or casual acquaintances, a man who can play with an accidental bluebottle but doesn’t have anybody to turn to when he really needs support and kindness. A man who seems to live in his office, has no hobbies and no pastimes. Women old and young throw themselves at him all the time. He doesn’t shave, doesn’t wash his garments, doesn’t change his shirt, not even after a sleepless night spent at a police station, and he drinks evil spirits because in time of trouble there is no friend like a liquid friend. So what he can be ironic, occasionally even funny most of the time? So what he doesn’t take any jibes, not even from murderous psychopaths or hard-as-nails cops? He is still a Gary Stu, just written really, truly well. My other carping concern women surrounding Marlowe in this one. As with many other Chandler novels, all females presented here are a bunch of duplicitous backstabbers. Mousy, coy backstabbers, dark Latina sexpot backstabbers, or glamorous, icy Cinderella backstabbers, it doesn’t matter. Maybe it’s only me but it seems Mister Chandler was wronged by women more than once and decided there is no revenge like literary revenge. He was right even if you cannot call it gentleman-like. Now the good things. The first chapter is perhaps the best first chapter of the Marlowe novels I’ve read. It is snabby, funny, riveting, and fantastic, thanks to Marlowe’s quick sardonic wit and turn of phrase. Say what one must about his characterization, but Chandler knew how to string words together. If only he didn’t have a propensity for convoluted plots. Still a classic I will return to when my mood takes me again – it was hardly flawless but it was good. This entry was posted in book review, classic, crime, whodunnit and tagged 30's in the USA, classic, crime story, hollywood, meh, noir, philip marlowe, pre IIWW, raymond chandler, reviewing a classic, series alert. Bookmark the permalink. You seem to be in noir mood. Read any of Megan Abbott’s noir novels?